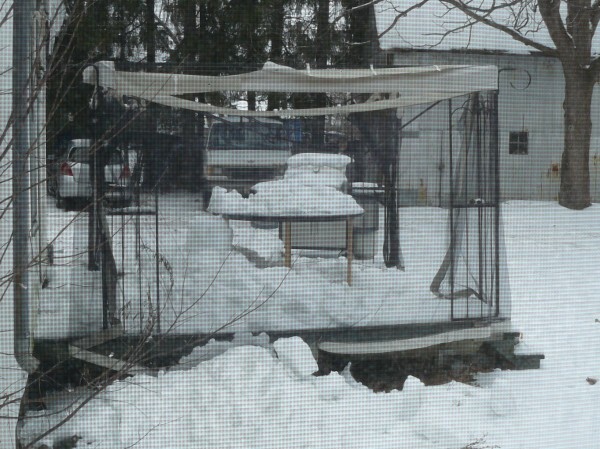 A little snow can cause a lot of damage if it all collects in one place. For anyone not aware, this part of Ontario got an early taste of winter last week. Even today, 4 days later, there is still a large amount of snow on the ground. I’m not even sure if enough melted today to allow us to see the grass again. After the really late snow we had last year, a whole lot of people got caught off guard with this “early” snow storm. Like most people I know, I didn’t have the winter tires on the car and we had to search for things like boots, gloves, shovels, windshield washer fluid and more. Their house has a metal roof much like ours and unfortunately,with the warmer weather today, all of the snow on the roof started to come down. In the process, it looks like it wiped out the gazebo on their deck. Super Crappy! Now, snow on metal roofing is a rather interesting thing. When it melts enough, the entire sheet of snow will come crashing down. It can sound like a freight train if there is enough snow buildup. I’ve learned to avoid the edges of my house on warm sunny days after we have had a decent snowfall. I got hit once by a smaller load of snow coming off of my roof the first winter we lived here. It didn’t tickle at all. This entry was posted in General, Kemptville and tagged metal roofing, Ontario, Snow, snow storm, snowfall on 2007/11/25 by Jeff Ivany.